WOW… What an amazing weekend we had here in Vancouver; the sun was shining and everyone was out and about enjoying the great outdoors. I commute on my bike every day to GWA, then I commute to teach a few classes here and there, and then back to GWA, and then home… my cycles become monotonous and boring. However, this weekend it felt great to be in the fresh air and on my bike. 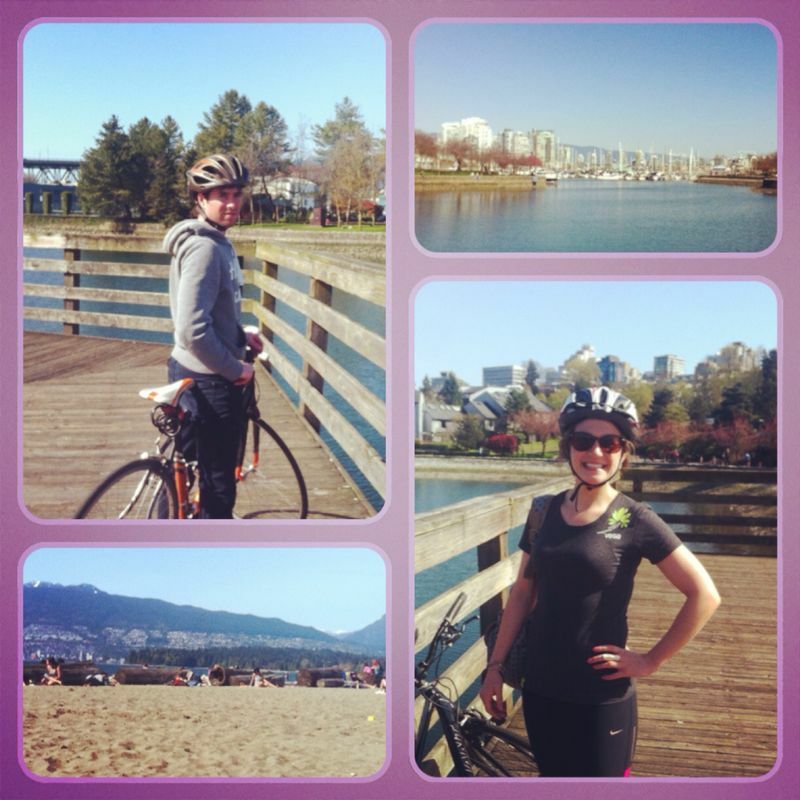 Saturday’s ride was a leisurely one around the sea wall with many pit stops for a friend’s birthday. On this ride I got to see places I never knew existed; hockey fields I had never come across before, volleyball nets, tennis courts, parks and parks (for Frisbee, tag, creative workouts etc.). Sunday’s ride was similar to Saturday’s but my impatience got the better of me and I spent most my time ringing my bell; for my next ride I will venture a little further afield and do a ride that my GWA legs are made for! If you are reading this and feeling cycling isn’t for you then there are still plenty of other options to choose from. If you enjoy team sports round up a few friends, take a volleyball and head down to the beach to get in your exercise. If you’re weekends are dedicated to the family, involve them too; take a hike around Deep Cove for example. Or if you want to spend some quality time with your partner a match of tennis is a fun choice, or even better - play doubles with another couple (this way you won’t be the only female moaning when your other half slams the ball at you so hard that you’re unsure what his objective behind the serve is). 10 squats – standing in front of the log – facing away from it. Squat down making sure your bottom taps the log each time. 4 sets of shuttle runs (on the sand – oh yes) to the sea and then back to your log. 8 step ups with the right leg, repeat on the left. Lateral shuffle – start of at the right end of the log, get nice and low and shuffle sideways to the left of the log. Tap the log and shuffle back to the right (repeat 5 times). Decline push ups – Hands on the sand positioned slightly wider than shoulder width, feet on the log – perform 10 push ups. Incline plank with a hamstring curl – place your hands on the log (shoulder width apart) and align your toes behind you so you are in a diagonal line from head to toe – no hips sticking up. Engage your core and then curl one leg up, flexing at the knee so you can feel it working the hamstring before repeating on the other leg. Perform 10 on each side. 2 mins – begin your jog home WHEN………………. Perform 2 sets of stairs – 1 single and 1 double. When you get home make sure that you drink plenty of water to rehydrate and enjoy a lovely spring style dinner full of vibrant seasonal vegetables. If you decide to try the workout I would love to know how you got on…good luck…and have fun in the sun everyone! !